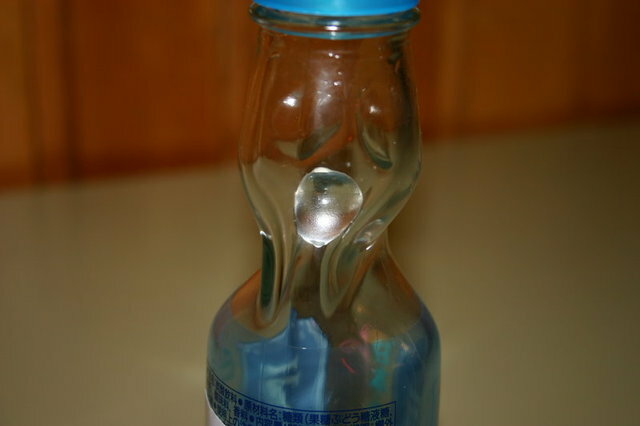 Ramune (ラムネ) is a carbonated soft drink sold in Japan. It is widely known for the distinctive design of its bottle, often called Codd-neck bottles after the inventor, Hiram Codd. They are made of glass and sealed with a marble; the marble is held in place by the pressure of the carbon dioxide in the drink. To open the bottle, a device to push the marble inward is provided with the bottle. The marble is pushed inside the neck of the bottle where it rattles around while drinking. Two little glass nodes inside the bottle allow the drinker to hook the marble in place while drinking. you get these in india too!!! they're called "goli sodas" (marble soda) because of the marble inside the neck. Sadly, with the advent of Coke, Pepsi & Gatorade, sales of goli sodas have dipped. But drinking the lemon flavoured soda was quite a treat in itself, with the vendor opening the bottle with a flourish! Oh man! I used to drink that a lot! I haven't had one in a while though.